← Galbraith Access Preserved Forever! This property is located in the large patch of trees within 911 and Jack and the Beanstalk and is now known as the Lake Forest Preserve. Below is the story of this property and how it ended up as a preserve. Over a year ago, Josh Neyman from City Parks received a call from Jennifer and Steven Lake who were coming into Bellingham in August. Steve grew up in Bellingham and attended Sehome High School, but had lived on Maui for 27 years where he owned a business. Steve’s father George had just passed away and they needed to handle his estate and were curious about a 1.4 acre parcel of land they owned up on Galbraith. Josh immediately gave them Eric Brown’s information and they contacted Eric shortly after. 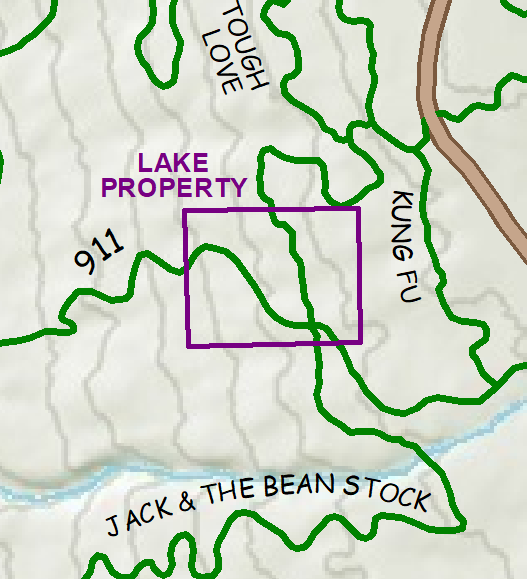 As soon as Steve and Jennifer described the property and confirming it on City IQ software, Eric knew the piece of land that the Lake’s owned and it’s exact location….the big woods that 911 and Jack and the Beanstalk go through! Steve’s dad, George Lake, used to work for Jim Hoag and even excavated Hoag pond back in the 1940’s. To thank George, he wanted to give George a parcel of land on Galbraith, but George declined the offer. So, instead, Jim Hoag deeded the property in 1951 to Steve when he was only 6 months old! When the Lake’s arrived into Bellingham, Eric gave them a tour of the mountain and drove them up to the top of 911. They hiked into their property over recent logging debris at the top of 911 and they got to see this property for the first time ever! They fell in love with the big trees and the beautiful understory and really wanted to preserve this beautiful setting on the mountain forever. Over the past year, the Lakes and Eric spoke many times about their land and they decided to put the land in a trust and then enter into a recreation and conservation easement with the WMBC. The agreement, which was prepared by the firm of Brownlie, Wolf & Lee, guarantees recreational access and will ensure the big trees stay forever on Galbraith. 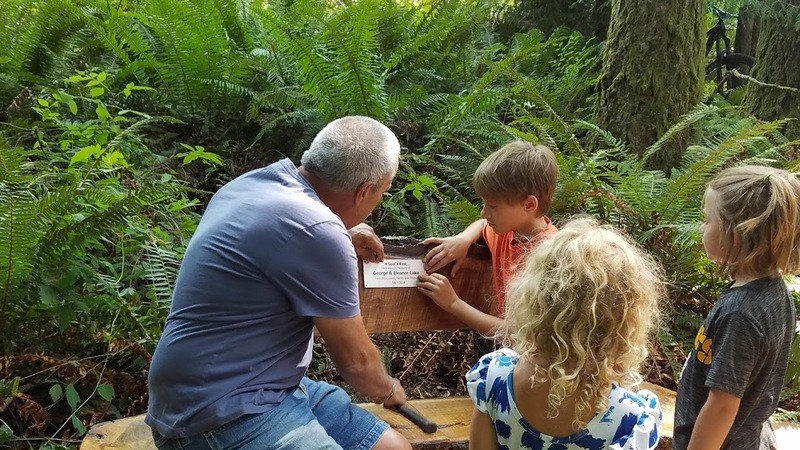 To dedicate the new “Lake Family Forest Preserve”, Steve’s son, Tyler, donated Elm wood slabs and our own Mark Belles welded a frame for a beautiful new bench. On Saturday, July 28th, the Lakes along with their family, friends and several of the WMBC Board members convened at the new bench – which is located at the 911/Jack and the Beanstalk intersection and held a really nice dedication ceremony. The bench has a plaque that dedicates the forest preserve to Steve’s parents – George and Eleanore Lake. Posted on August 6, 2018, in Uncategorized. Bookmark the permalink. Leave a comment.